This painting was inspired by an experience I had during my initiation into Sehaj Meditation with Gita Chavda. I saw the most loving pure light enter the room. When I told Gita about it she said “Oh Barbara, you will have to paint it. “ I thought this rather absurd because I knew that you can only create light with light. This painting is my humble attempt at using paint and canvas to convey my experience of this exquisite pure light. A fascination with Sacred Geometry lead me to explore the many aspects of creation and the forms it takes. This painting started with the golden mean spiral and ended up being pure fun. Every time I look at this painting I just feel Happy! The circle is the basis of form. In mathematics, the study of the circle inspired the development of geometry. Orbs are life forms which often appear in digital photography when spiritual energy is high. The orbs appeared to me on a full moon at Luxor temple and later I saw them in a photograph that was taken on that magical evening. SOLAR JOURNEY was inspired by my dear friend David Hickey. David's Journey through the Solar System tour in 2009 was mind altering. As I listened to the planetary gongs and clear crystal tones I was transported into my own journey through spiral galaxies. Earth's Ascension is the story of Gaia and her evolving nature. She was born from the consciousness of the stars and made ready her Starseeds in Crystal cities until they were able to come into the garden and seed the new earth. Then the wise ones came and left the codes in the ancient monuments and stones that we should never forget who we are, but somehow we became distracted and forgot to honour the gifts of the Earth. The dolphins and whales never forgot... they held the codes within the waters. With the help of a new awareness that came forth from our dreaming Mother Earth was able to ascend and birth herself anew. 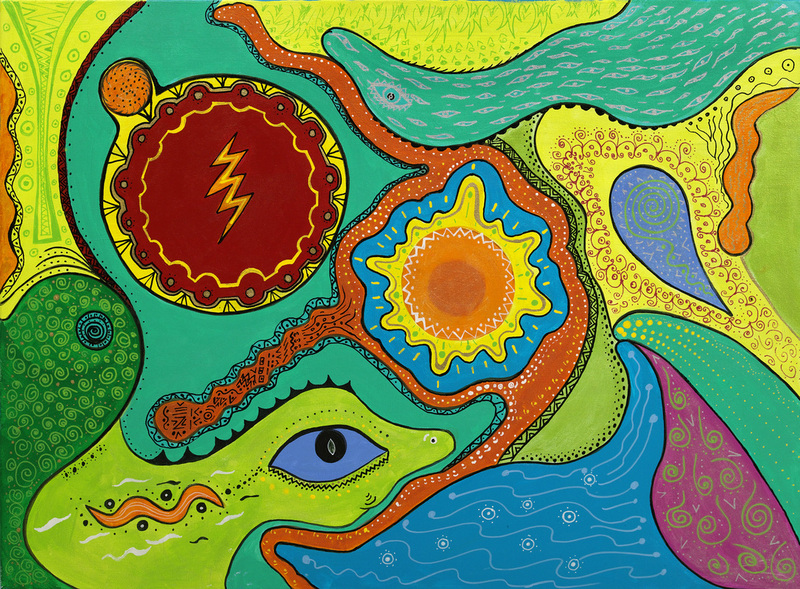 The colour and fun of Mexico inspired this primal depiction of creation.